Living Cooperative Economics-UJAMAA een de Gullah/Geechee Nation! UJAMAA is the Nguzo Saba principle of Kwanzaa which means “cooperative economics.” Collectively coming together to share in the production and transfer of wealth is critical to the sustainability of any community or nation. Therefore, this is a topic of vital interest to the Gullah/Geechee Nation which has managed to sustain itself in spite of various forms of exploitation, economic embargos as attempts to prevent their forward progress in self-determination, and disenfranchisement via land takings. Over the generations prior to bridges coming and prior to integration, Gullah/Geechees supported one another on a daily basis economically. The influx of vehicles of consumerism in the form of franchises and big box stores has started a decline in storefronts owned by people of African descent in North America including Gullah/Geechees. However, Gullah/Geechee traditionalists continue to economically empower themselves through the daily practice of cooperative economics. Families pay taxes collectively, fish fries and oyster roasts are held in the community as fundraisers to benefit non-profits and community projects, etc. Wha eba da gwine on, folks gee wha e kin gee! 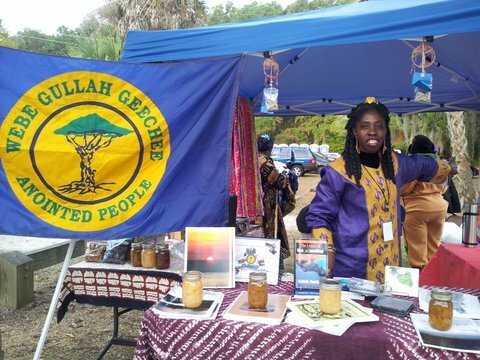 To expand the circle of those that are able to support the Gullah/Geechee artisans, authors, and tour operators, the Gullah/Geechee Nation launched an online store at http://www.gullahgeechee.biz. All the items are produced within the Gullah/Geechee Nation and the funds support those that the create the items as well as the work of Gullah/Geechee Nation community organizations. What is brought in gets shared throughout the circle of the Gullah/Geechee family compounds and helps to keep that and other institutions going. Tune in and then go out and support! ← UJIMA een de Gullah/Geechee Nation!